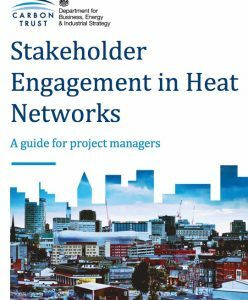 At the beginning of July BEIS finally released their long awaited ‘Stakeholder engagement in heat networks: a guide for project managers’. This document was produced by the Carbon Trust with the support of Bill Kirkup at CAG. Heat networks, particularly at the district scale, are often large, invariably complicated and have lengthy lead in and delivery timeframes. As a result, they involve multiple stakeholders, in a variety of forms, whose relative significance shifts over time. ment is a major challenge for heat network developers. This new guidance is intended to assist heat network developers, particularly those in the public sector, to meet this challenge. It can be accessed here.